One of the primary methods used to change the weight distribution across a truck's axles is to slide the trailer tandems toward the front or rear of the trailer. But there are laws regulating how far forward or back the tandems can be placed. The two primary laws governing the placement of the tandems are the Bridge Formula and the maximum allowed length from Kingpin to trailer tandems. The Bridge Formula is set by the Federal government but can be altered somewhat by the individual states. When the Interstate System axle and gross weight limits were adopted in 1956, and amended in 1975, States were allowed to keep or "grandfather" weight limits that were higher. On the other hand, the maximum allowed length from the trailer kingpin to the trailer tandems is set solely by the individual states. So once again, we have a mix of State and Federal regulations to contend with. Let's take a look at these two laws and why they're put into effect. The idea here was to prevent putting too much weight on a relatively small area, causing damage to road surface and bridge structure. 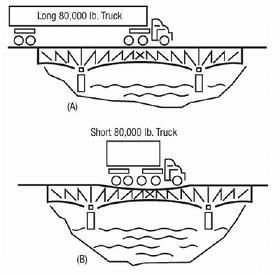 By requiring trucks to spread the weight across a longer distance and distributing the weight across more axles, you help prevent damage to the bridges and roadways. 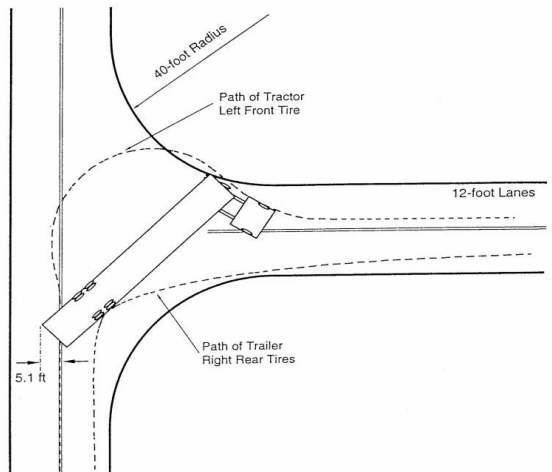 When a combination vehicle makes a low-speed turn - for example a 90-degree turn at an intersection - the wheels of the rearmost trailer axle follow a path several feet inside the path of the tractor steering axle. This is called low-speed offtracking. Excessive low-speed offtracking may make it necessary for the driver to swing wide into adjacent lanes to execute the turn (that is, to avoid climbing the inside curbs or striking fixed objects like telephone poles). 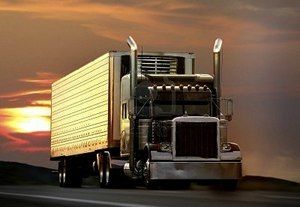 This performance attribute is affected primarily by the distance from the trailer kingpin to the center of the trailer rear axle, otherwise known as the wheelbase of the semitrailer. To prevent trucks from being too long to maneuvering safely around turns encountered in cities and towns, the maximum length allowed from the kingpin to the trailer tandems is set by the individual states. So as you can see, we can't put the axles too close together or the weight being applied to the roadway in a given area will be too great, causing damage to roadways and bridges. But at the same time, we can't make the trailer wheelbase as long as we like without making the truck nearly impossible to maneuver safely in cities and towns. So we have to work within the legal limits of the overall gross weight of the vehicle, the axle weights of the vehicle, the load rating of the tires, the load rating of the axles, The Bridge formula, and the maximum length allowed from kingin to trailer tandems. That's a lot to take into consideration. In the remainder of this section we'll be putting all of this together and showing you what it takes to get legal under any circumstances. You will not need to do calculations using this formula. It's purely for understanding how the numbers are derived. You will be using charts to look up legal weight and length limits. When a combination vehicle makes a low-speed turn the wheels of the rearmost trailer axle follow a path several feet inside the path of the tractor steering axle. When a combination vehicle makes a low-speed turn - for example a 90-degree turn at an intersection - the wheels of the rearmost trailer axle follow a path several feet inside the path of the tractor steering axle. This is called low-speed offtracking. Why did Congress enacted the Bridge Formula in 1975? To limit the weight-to-length ratio of a vehicle crossing a bridge. Congress enacted the Bridge Formula in 1975 to limit the weight-to-length ratio of a vehicle crossing a bridge. What is the main factor affecting the low-speed offtracking of a tractor trailer? What are the two primary laws governing the placement of the tandems? The Bridge Formula and the maximum allowed length from Kingpin to trailer tandems. The two primary laws governing the placement of the tandems are the Bridge Formula and the maximum allowed length from Kingpin to trailer tandems.